November 9, 1999 The Little Rock Nine received the Congressional Gold Medal which, along with the Presidential Medal of Freedom, is the highest civilian award in the United States. The medal is bestowed by the United States Congress on individuals who perform outstanding deeds or acts of service to the security, prosperity, and national interest of the U.S. On May 17, 1954, the United States Supreme Court issued its decision in Brown v. Board of Education declaring all laws establishing segregated schools to be unconstitutional and calling for the desegregation of all schools throughout the nation. By 1957, the NAACP had registered nine black students to attend the previously all-white Central High School in Little Rock, Arkansas. Arkansas Governor Orval Faubus deployed the Arkansas National Guard to block the students from attending the school. President Dwight Eisenhower ordered the 101st Airborne Division of the United States Army to Little Rock to facilitate the entry and provide protection to the students. 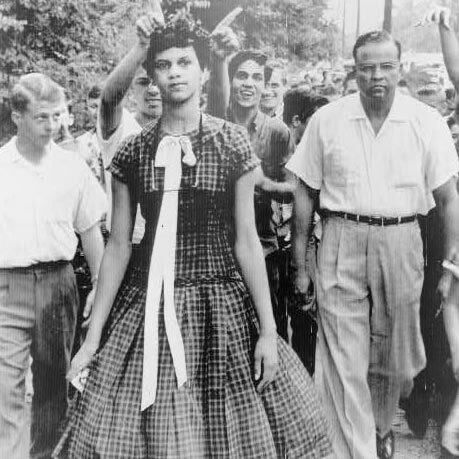 On September 25, 1957, the Little Rock Nine successfully entered Central High School. 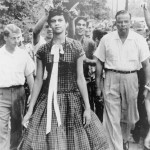 During their ordeal, the Little Rock Nine were advised by journalist and activist Daisy Bates and for their efforts they received the NAACP Spingarn Medal in 1958.